ISIS has threatened judges in Egypt with death after a decision to execute former president Mohammed Morsi last week. Islamic State has threatened judges in Egypt with death after issuing a decision last week to have former president Mohammed Morsi executed. The terror group issued the threat on Thursday, just days after three Egyptian judges were killed in Sinai. An audio recording on an ISIS site which was said to have been issued by the “Islamic State in Sinai” group featured what the site said was voice of group head Abu Osama al-Missri. "The Egyptian tyrants cannot jail our brother Morsi. Poison their food, follow them to their homes and neighborhoods, destroy their homes with bombs, if you can,” al-Missri said in the message. 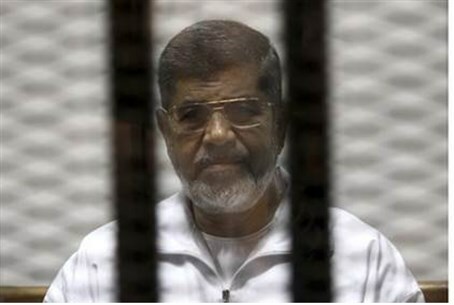 An Egyptian court sentenced Morsi to death on Saturday, along with a number of other Muslim Brotherhood leaders. Current President Abdel Fattah al-Sisi has made it his mission to crack down on Islamists, including the Muslim Brotherhood and its Palestinian branch, Hamas. The cabinet designated the Brotherhood as a terrorist group in December 2013, "indefinitely" closed the Rafah border crossing to Gaza, and is now building a separation barrier between Gaza and the Sinai Peninsula. The sentence was condemned by the European Union and the U.S.
"The court decision to seek the death penalty... was taken at the end of a mass trial that was not in line with Egypt's obligations under international law," the EU's top diplomat Federica Mogherini said in a statement. "The EU opposes capital punishment under all circumstances. The death penalty is cruel and inhumane." Turkish President Recep Tayyip Erdogan on Saturday night blasted Egypt for the death sentence, saying it meant that "Egypt is turning back into ancient Egypt. The West, unfortunately, is still turning a blind eye to Sisi's coup."